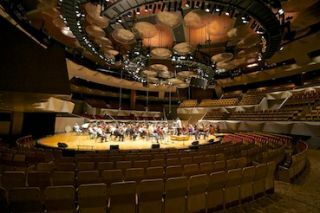 Denver Performing Arts Complex’s Boettcher Concert Hall, home to the Colorado Symphony Orchestra, was built in 1978 as the first U.S. symphony hall in the round. While the 2,634-seat performance space’s unique layout continues to remain enduringly contemporary, the venue’s previous PA system has not fared quite so well, recently prompting a full audio system retrofit that included an L-Acoustics amplifier and loudspeaker package. The City of Denver hired South Norwalk, CT-based acoustician/consultant Akustiks to specify the new system, which features an exploded cluster design using ARCS II and KIVA loudspeaker lines. Supplied by AVDB Group, the system was installed by Steve Kuberski and Mark Herron at Mood Media (formerly known as Muzak). The primary PA is comprised of four horizontal arrays of ARCS II—a cluster of six constant curvature cabinets pointing toward the main orchestra seating section, two four-cabinet arrays firing into the left and right mezzanines, and a smaller three-enclosure array covering the rear parquet section. Three additional ARCS II—each individually hung in a horizontal orientation—serve as upper front-fills and address the upper ring and rear mezzanine seats. Four double-stacked KIVA clusters are also positioned overhead to supplement coverage to some of the upper seating and other areas. Down below, up to eight additional KIVA can be positioned on the stage lip as needed for front-fill, while low frequency reinforcement in the space is achieved via four SB15m subs arranged in a cardioid configuration. System power, processing, networking and control are accomplished through a combination of six LA8 and two LA4 amplified controllers. Over the past couple of years, the Colorado Symphony Orchestra has increasingly peppered its show roster with soloists and guest acts as diverse as Trey Anastasio, Béla Fleck, Guster, DeVotchKa, Kip Winger, Pink Martini, and Rodrigo Y Gabriela. Christensen points out that the system gets used on almost a daily basis, be it providing simple vocal reinforcement for the conductor introducing pieces to full reinforcement for a band with some spot-miking of various orchestra soloists.